Existing-home, which are finalised transactions that include single-family, townhomes, condominiums and co-ops, slipped 0.6 per cent nationally to a seasonally adjusted annual rate of 5.02 million units in February from 5.05 million in January, but are 7.0 per cent higher than the 4.69 million-unit pace in February 2009. Total housing inventory at the end of February rose 9.5 per cent to 3.59 million existing homes available for sale, which represents an 8.6-month supply at the current sales pace, up from a 7.8-month supply in January. Raw unsold inventory is 5.5 per cent below a year ago. Sales in February 2010 (5.02 million SAAR) were 0.6% lower than last month, and were 7.0% higher than February 2009 (4.69 million SAAR). Sales surged last November when many first-time homebuyers rushed to beat the initial expiration of the tax credit. There will probably be another increase in May and June this year, although that will be probably be smaller than the November increase. Note: existing home sales are counted at closing, so even though contracts must be signed in April to qualify for the tax credit, buyers have until June 30th to close. According to the NAR, inventory increased to 3.59 million in February from 3.27 million in January. The all time record high was 4.57 million homes for sale in July 2008. Inventory is not seasonally adjusted and there is a clear seasonal pattern – inventory should increase further in the spring. The last graph shows the ‘months of supply’ metric. Months of supply increased to 8.6 months in February. 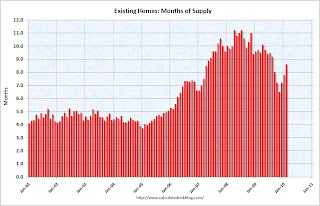 A normal market has under 6 months of supply, so this is high – and probably excludes some substantial shadow inventory. 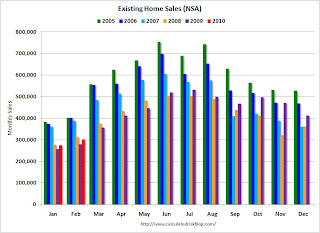 This graph shows NSA monthly existing home sales for 2005 through 2010 (see Red columns for 2010). 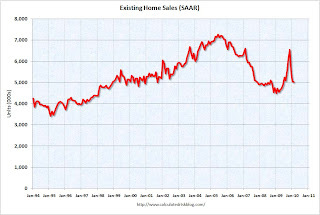 Sales (NSA) in February 2010 were 7.9% higher than in February 2009, and 3.2% lower than in February 2008. We will probably see an increase in sales in May and June because of the tax credit, however I expect to see existing home sales below last year later this year. 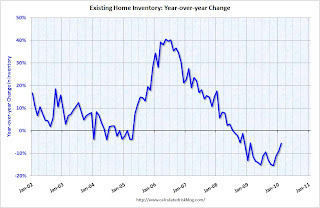 The second graph shows the Year-over-year change in reported existing home inventory. There was a rapid increase in inventory in the 2nd half of 2005 (that helped me call the peak of the bubble), and the YoY inventory has been decreasing for the last 19 months. However the YoY decline is getting smaller – even with a large reported inventory (and probably more shadow inventory). This is something to watch. 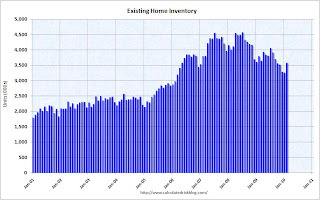 This slow decline in the inventory is especially concerning with 8.6 months of supply in February – well above normal.